Deadpool's latest story lobs him in a slow arc toward the Marvel universe's villains. Since changing the title to "Despicable Deadpool," Gerry Duggan has piloted Wade through some superb clashes with the heroes who've crossed his path in the past year. Drawing a bead on random bad guys is proving less entertaining so far - but there's still a lot of story to tell. This is a super-tough comic to talk about without spoilers because it's decompressed to within an inch of its life. All of this issue's plot development could be neatly and comprehensively packed into a single not-too-complex sentence. The main body of the book is a straightforward heist. 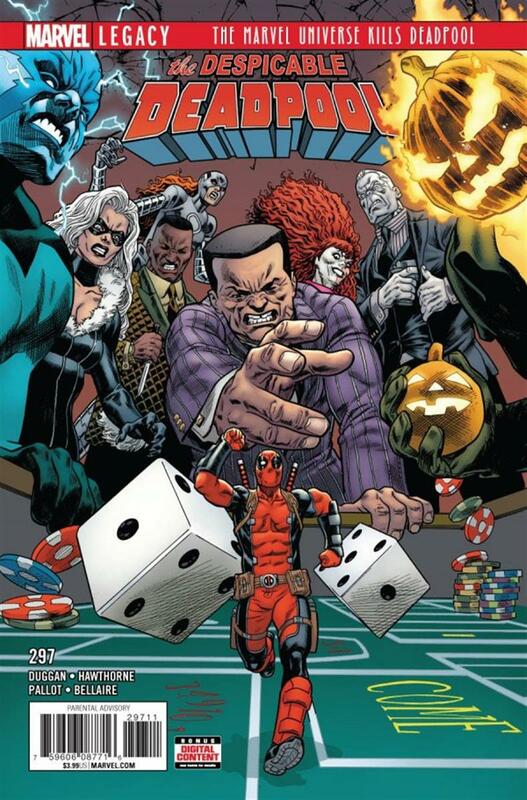 Deadpool steals a bulging bag o' loot from Tombstone's casino boat. Getting away with the cash entails beating on the boat crew, New York's Finest, and some mega-cheesy D-list villains. Did you realize Marvel has never before given us the pleasure of Stilt-Man teaming up with Lady Stilt-Man? Despicable Deadpool #297 fills that gap by pitting the pair against Deadpool. Sadly, by the time you've realized how spectacularly silly-stupid-awesome such a scene could or should be, it's already over. Team Stilts is assembled and defeated in one breathless page, alas. No space for an epic Stilt-fight, and yet the final scene milks six pages out of about two panels' worth of plot development. Curse you, double-shipping decompression! Gerry Duggan's script doesn't offer up a lot of complex character insight in lieu of advancing the plot. There are a few light brushstrokes that paint a clear shadow of his mood and give him reasons to do what he's doing. Deadpool's also deploying a lot of questionable humour - two tasteless gay jokes in one issue, yay - but here too, the script delivers clear hints about why Deadpool is relentlessly quipping like the misbegotten love-child of Peter Parker and Andrew Dice Clay. Crude though they are, the jokes are executed with skill; if you love your Deadpool dark and dirty you might want to bump our 7/10 rating up by a point. Mike Hawthorne and Terry Pallot contribute art that carries the story well. Their designs for the D-list villains on Tombstone's boat are slightly grotesque, but that feels like a conscious choice and a successful one. Mr. Hawthorne's talent for showing off Wade's emotions right through his mask is utilized to its utmost, and it's a much better option than whipping the mask off whenever pathos is called for. This issue's colour palette is a surprise and not a pleasant one. Jordie Bellaire is a world-class colourist, so we can assume this muddy, murky scheme - full of ugly yellows, anemic reds, and slushy blues - is an intentional choice. To what end, though? Are the drab colours meant to mirror Deadpool's mood? I found the colours to be the key to unlocking this issue, and the answer to that question is a resounding "yes, these murky visuals reflect how Wade feels right now." They're ugly, but intentionally so; that ugliness reflects where Deadpool's head is at. Hawthorne and Pallot's crew of grotesque D-listers are also fitted to this dark tone, as are the slow pace and the near-nihilist characterization of the protagonist. I can respect the fact that a wacky extended fight with Team Stilts wouldn't fit this mood. That's a different mountain from the one the creative team is climbing here. While their climbing is technically accomplished and driven by a unifying theme, I can't say the view from the top is all that pretty. I wonder endlessly about what Gerry Duggan's Deadpool is like in the alternate universe where it's not double-shipped.